Comfort and convenience await guests of Ramada Panama Centro via Argentina, Panama hotel near Via Espana and the Amador Causeway (Calz de Amador). 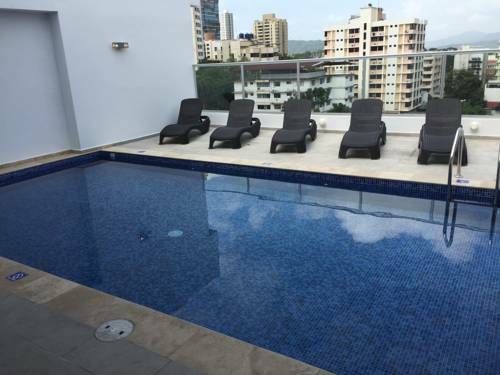 This centrally located, newly constructed lodging facility is half an hour from Tocumen International Airport (PTY), near many area businesses including Penta Global, Sony Inter-American, and Panasonic Latin America and near Bingo 90 and Fantastic Casino. Nearby attractions include Metropolitan Natural Park, Multiplaza Pacific Mall, Herons' Palace, Panama Canal Museum, Rod Carew Stadium, Panama University, and College of Arts and Crafts Melchor Lasso de la Vega. There are several restaurants, cafes and bars within easy walking distance of this smoke-free lodging facility. Amenities include an onsite restaurant, room service, outdoor pool, fitness center, ample complimentary parking and complimentary breakfast. Meeting space is available, and guestrooms are appointed with complimentary wireless internet access, flat screen TV, microwave and mini fridge.